Reggie Littlejohn at a Capitol Hill Press Conference, with 200,000 signatures on petitions to end forced abortion and gendercide in China. Reggie Littlejohn is Founder and President of Women’s Rights Without Frontiers, an international coalition to expose and oppose forced abortion, gendercide and sexual slavery in China. Reggie also led the international effort to free blind activist Chen Guangcheng, who arrived in the United States on May 19, 2012. 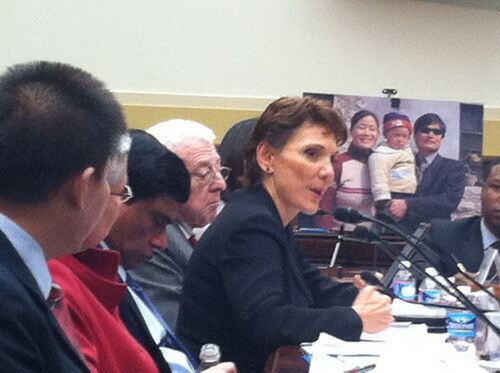 She and Chen Guangcheng appeared together on a Voice of America broadcast on January 31, 2013. Women’s Rights Without Frontiers seeks to form a left-right, human rights and humanitarian coalition to end forced abortion and gendercide. Both pro-life and pro-choice venues have embraced this message. Reggie received the National Pro-Life Recognition Award at the 40th March for Life in Washington, DC on January 25, 2013. She was also the keynote speaker for the 2013 March for Life Canada in Ottawa, and for the 2013 National Right to Life Convention in Dallas. 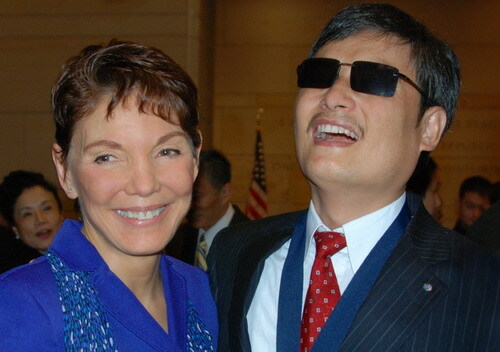 Reggie with blind activist Chen Guangcheng in Washington, D.C.
An acclaimed international expert on China’s One Child Policy, Reggie has testified six times at the United States Congress, three times at the European Parliament, and she has presented at the British, Irish and Canadian Parliaments as well. Her first address at the European Parliament redefined the debate about China’s One Child Policy, revealing it to be systematic, state-sponsored violence against women. This address was included as a chapter in the book, Human Rights in China After the Olympic Games, (Human Rights Without Frontiers, 2009), available on Amazon.com. Reggie has briefed officials at the White House, the United States Department of State, the United Nations and the Vatican. She is a frequent guest on radio and television programs, including CNN, C-SPAN and the BBC, and has issued several groundbreaking reports that are included in the Congressional Record. Reggie Littlejohn testifies at the emergency Congressional hearing regarding Chen Guangcheng of May 3, 2012, before the Congressional Executive Commission on China. A dynamic keynote speaker, Reggie has spoken at the Harvard and Stanford law schools, the Johns Hopkins and George Washington Universities, The Heritage Foundation, the Family Research Institute, Institute for Cultural Diplomacy and the Victims of Communism Memorial Commemoration. Reggie has appeared thirteen times on Voice of America, the official U.S. broadcast into China, Taiwan and Hong Kong. WRWF has the only Chinese website in the world dedicated to exposing the brutal truth about forced abortion in China.